HomeMD offers the Best Home Inspections Louisville KY for both Buyers and Sellers. A HomeMD Home Inspection Louisville KY can help you buy or sell your home with confidence. The trained professionals at HomeMD home inspection Louisville KY provide valuable information. This information helps identify potential problems and allows you to take preventative measures to avoid costly repairs. 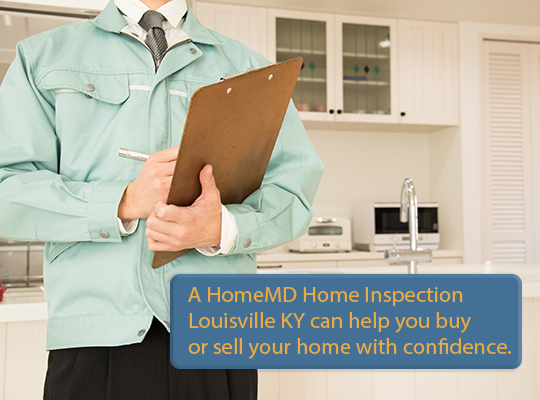 Buyers will have peace of mind with a HomeMD Home Inspection Louisville, KY. The offer has been made on your new home and there are only a few days for home inspection Louisville KY. The professionals at HomeMD home inspection Louisville KY can handle it. Overlooking problems can cost your thousands of dollars. After purchasing and moving into your new home, problems eventually begin to show up. Suddenly you have unexpected and expensive repairs you are not prepared to make. HomeMD home inspection Louisville KY will find these hidden, potential problems. By having a complete, detailed and thorough HomeMD home inspection Louisville KY, you are ensured of making a sound investment. HomeMD home inspection Louisville KY will inspect the home inside and out, from the basement to the roof. HomeMD home inspections Louisville KY offers a complete digital report with photos showing any problem areas. The buyer is always welcome to walk-through with the inspector during the home inspection Louisville KY to learn more about the home. 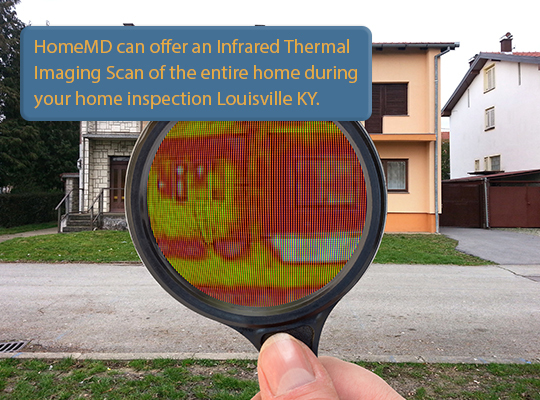 HomeMD can offer an infrared thermal imaging scan of the entire home during your home inspection Louisville KY. This helps show area of missing or displaced insulation and moisture from leaks inside walls and ceilings that are not accessible or visible during the standard home inspection Louisville KY. Buyers may also be interested in HomeMD’s New Construction Home Inspections Louisville KY. This is an independent review of the property during various stages of construction. Having a new construction home inspection Louisville KY protects your purchase and prevents unpleasant surprises. A sellers’ home inspection Louisville KY can show the strengths and weaknesses of a home. This will help determine what problems may need to be addressed immediately. A HomeMD home inspection Louisville KY can help the seller put the property in better selling condition by making needed repairs. The HomeMD home inspection Louisville KY will make the Seller better prepared for negotiations and able to ask a higher selling price. HomeMD home inspections Louisville KY offers professional, non-invasive inspections of your property for environmental hazards. These hazards may include mold and radon. Molds grow in moist areas and can produce allergens that could be potentially toxic. Radon is a naturally occurring radioactive gas found in soil, rocks, and water. Radon can be found in very high concentrations in homes. HomeMD Home Inspection Louisville KY can also arrange for your Termite testing.